Holiday.gr - Naxos town, a trip to a myth! Naxos town or Chora is the capital of the island and impresses the visitor with its unique beauty. It has all the traditional elements of Cyclades Islands, but the monuments of different times of period you see as you enter the port, give it a special identity. In the port's entrance, in the small island of Palatia, is located Portara. An impressive welcome to Dioniso's island that promises unforgettable holidays. Chora is built in the middle of the west shore of the island, in the same place as the ancient one. The monuments reveal the rich past of this island. In the north part of Chora we meet the archaeological site of Grotta. The venetian castle on the hill keeps alive the medieval atmosphere and the mystery of that time. During the tour around the town, the visitor has the opportunity to see the traditional architecture and the Byzantine churches. In Chora is located the island's archaeological museum and the school of Oursoulines that distinguishes for its architecture. Agios Georgios beach in the south part of Chora and on the north of Grotta, attracts most tourists during summer. Naxos is a beautiful place that has everything. Hotels with all comforts, restaurants and picturesque taverns where you can taste the unique local cuisine, bars and clubs with live music where you will dance till dawn. 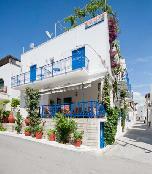 In Naxos you will find all the traditional products, products of folklore art and boutique shops. And if you care for a souvenir take a look at the handmade ceramics and webs that have a long history in the island. 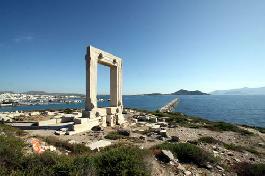 Been to Naxos town ? Share your experiences!